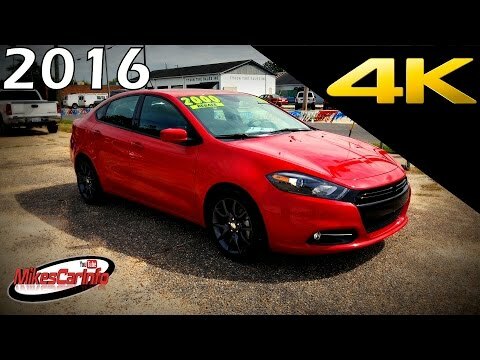 Using one of Fiat's most popular platforms, the Dodge Dart compact sedan for 2016 offers more than just great gas mileage at an affordable price; it's actually a blast to drive. With three engine options and five models from which to choose, the stylish Dart offers more customization options than the Ford Focus, Honda Civic, Mazda3 or Toyota Corolla. Great car to have all around. This model has a multi air system that requires more oil changes to keep it in good condition. Good gas mileage though and has a nice feel to it when driving it. Can get up to a good speed fairly quick as well. The stock sound system it came with is really good. It is a comfortable drive and it is fairly reliable outside of the oil changes. Some of the best features is the power locks and windows. The radio comes with Bluetooth accessibility as well as an auxiliary cord port. It is a smaller car so not a whole lot of legroom for those that have a full car of bigger adults. However it is a great family car and can seat five total. This vehicle has a good amount of trunk space as well. Has sensors for the tire air pressure and for the oil life. Also has a temperature gauge for display. This vehicle also comes with cruise control as well which helps with those long trips. The comfort of the vehicle makes driving it for those longer trips a lot easier to handle too and not to mention the gas mileage. Before purchasing this vehicle, I took one of the same as a rental for a six hour trip and it was easy. That was one of the driving forces in my buying this car. It handles turns real well and smooth. What has been recommended to me is that this car may require it to sit and warm up before driving it more often than other vehicles might. Nice trims of red the you can see at night. It is on the dash. Battery and shocks went out way too early. Decent gas mileage. Not a bad day to day car. Wouldn't recommend for longevity. Dodge brand does not have the best reputation. I was able to drive from one state to the next a few times and it gave me no issues at all. I love the 8. 4 touch screen it has. It is very convenient. It comes with Bluetooth. The Bluetooth sometimes does not connect with newer iPhone. But it is workable. It has comfortable seating except for the head rest. It is annoying. It leans forward and it is not adjustable. A little spacious for such a small car, but it is a small car. The sports features are decent. One cool feature is the red trim that glows at night that runs around the dashboard, my fav feature. It gets great gas mileage. 33-45 mpg. It's also a good size for a family and has one of the highest safety ratings which makes me feel a lot more comfortable for my child. It's also a turbocharged 6 speed car so its fun to drive and has that little kick of speed to it as well. I love it. The trunk has so much space as well. Great for trips! I really don't have many problems to list other than the cup holders are super close to the middle console. Without functioning windshield wipers, the driver's visibility may be reduced, increasing the risk of a crash. Chrysler will notify owners, and dealers will replace the windshield washer pumps, free of charge. The recall began on December 28, 2016. Owners may contact Chrysler customer service at 1-800-853-1403. Chrysler's number for this recall is S83.